Last year, I made a 100W solar system. The system was good enough in the end only to power up a 12W LED tube for 6 hours. Add to the fact I broke 40W out of the 100W because I didn’t mount it properly. So this year I decided to go big to power something significant, which happened to the LED lights at the reception in my mother’s hospital. My primary motivation for setting up a solar system has and will always be to combat Global Warming. Secondary motivation is that it’s fun to generate your own power. I bought the 20A PWM phocos charge controller to charge batteries of 24V,150Ah that can store 3600Wh ideally, but practically only 2800Wh can be used. The batteries are Su-kam tall tubular make and turned out to be a bad choice as well as a bad product. Firstly, they only gave a capacity of 75Ah. I think it was due the fact that battery was 3 months out of the factory when I bought it and lead acid batteries may not survive without degradation for that long. Additionally it seems normal tubular batteries cannot survive solar application. Within 2 months, the battery regressed to 50Ah and I had to replace them. I ordered and bought 2 Nos of 150Ah Exide Solar tall tubular battery. This battery, which has the ability to go long periods in partial state of charge, has turned out good so far, though I haven’t pushed the battery to full discharge and see its capacity. The inverter I chose initialy was 1500VA,24V su-kam shiny UPS and not a solar hybrid inverter as I wanted a separate charge controller. But this turned out to be a bad choice too, as the inverter has 36W of self consumption losses and more importantly it did not have no load shutdown feature, which means someone has to manually turn off the inverter whenever there is no load connected in the output. I looked for a new inverter. I didn’t want an inverter with bulky iron core transformer as it was heavy and decided to try a inverter with high frequency transformer. I bought 1KVA,780W Sinex Solar PCU by Electronet Systems from GoGreenSolutions. It turned out to be fair. This solar inverter (aka solar PCU) has an no load shutdown and automatic wakeup feature. It has an disappointing self consumption of 24W when in operation and 6W when on standby mode, but still better than the pervious one due to no load shutdown. It is light and weighs 4.5kg, unlike the previous one that weighed 16Kg. It has poor dynamic characteristics, but since the load is LED lights that have SMPS and my laptop which has SMPS too, it is not a problem. But my desktop which I rarely use turns off when I subject the inverter to a new load. The inverter has an good fan control that varies depending on load. Now for the overall power consumption of the system. 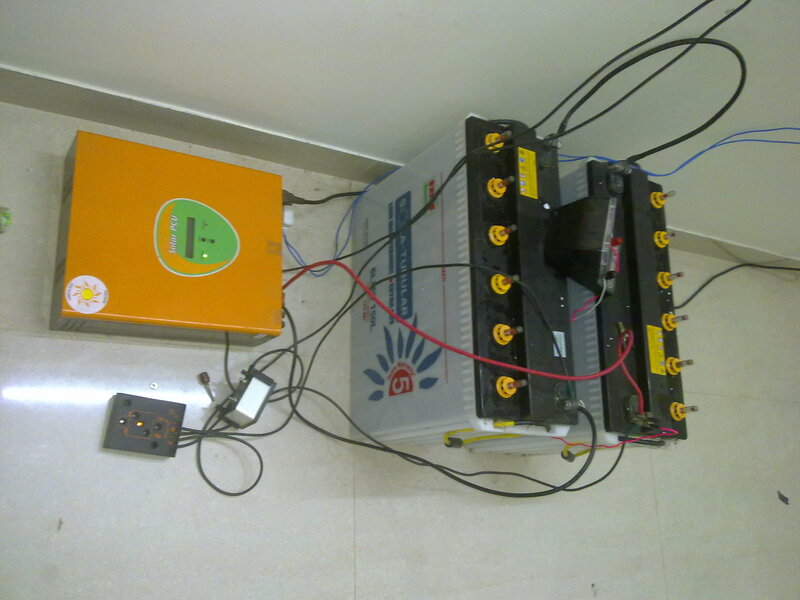 The total energy requirement is 1080Wh, but inverter efficiency is 90%, taking the consumption to 1188Wh. Additionally, the inverter has self consumption of 24W for 12 hours and 6W standby for 12 hours adding upto 1548Wh. The power generation during a sunny day is 2000Wh and hence there is a surplus of 450Wh that can be used to compensate for dull days. The battery has a Depth of Discharge rate of 45% (1548Wh of 3600Wh) and manufacturer Exide claims that it can last for 3000 cycles(8.21years) at this Depth of Discharge. The system serves well powering the reception lights of hospital. It is most useful during the time between power cut and when generator is turned on or when generator is down due to technical problems. The hospital does not remain in total blackout. Overall the system cost is Rs.78,000. Generating 1.5 units per day and operating for 8 years with no failure, it translates to Rs.17.8 per unit (excluding cost of Investment). However, if I can find ways to reduce the cost of the system, especially by consuming the generated power instatnly, then I may have an answer to my mother’s hospital’s Diesel generator, which operates at 8-12 hours per day, producing power at Rs.20 per unit. The use of LED lighting reduced the system size by 50%. Had I used CFL downlights and halogen floodlight, the system would have been atleast twice the size, costing an additional Rs.78,000. 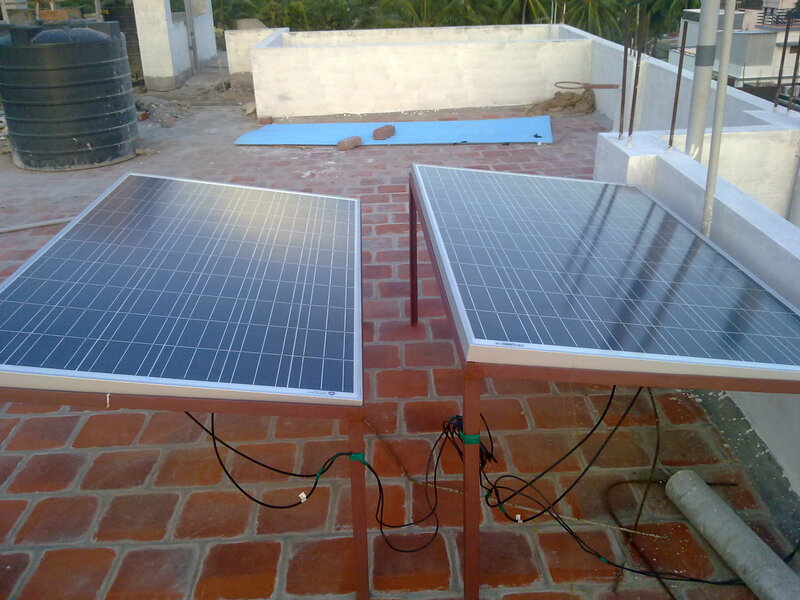 The cost incurred for the LED lights were Rs.23,000. So I realized that whem I’m generating my own power, every Watt hour of energy saved matters. I live in a state where power cuts are frequent and lasts upto 12 hours per day depending on the time of the year. Upto 50KWh is supplied for 12 hours by Diesel Generator. Currently the generator in my mother’s hospital produces power at the rate of Rs.20 per unit approx. That’s higher than what I acheived with my solar system. If I can make a big system that cuts costs then I might be able to bring down the cost of electricity supply while making the hospital contribute less to climate change. This web page by Solarii Knight Anand is licensed under a Creative Commons Attribution-NonCommercial-ShareAlike 3.0 Unported License. Awesome article man. I loved your way of narration and care to explain in details 🙂 Keep it going.